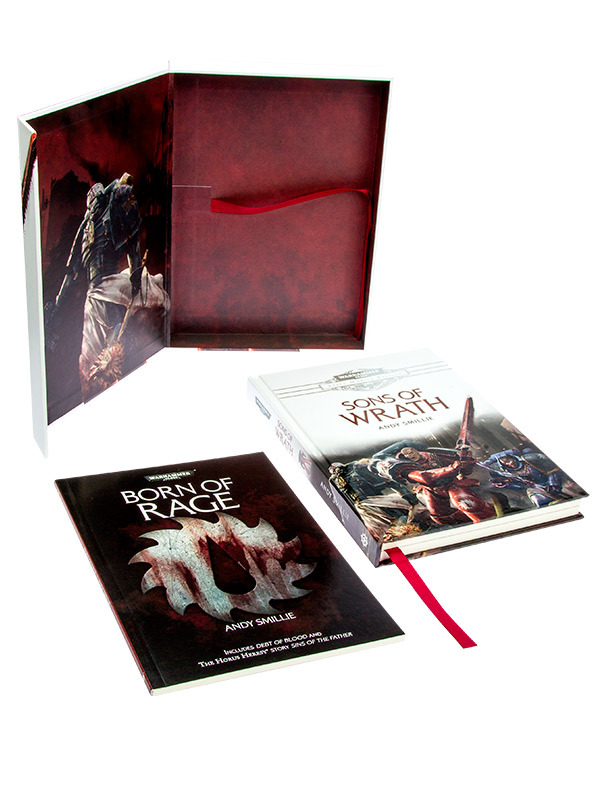 "Sons of Wrath" sera en vente à partir du 10 novembre à 3000 exemplaires limités et numérotés. 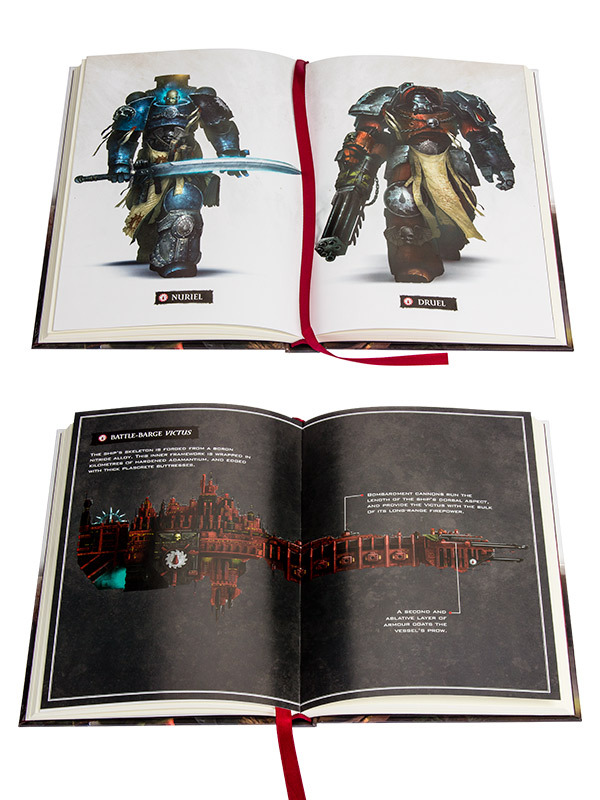 Ce coffret regroupe des nouvelles inédites d'Andy Smillie liées à Horus Heresy (avant et après). 1/ Born of Rage = Recueil (couv. souple) de 2 nouvelles HH "Dept of Blood" et "Sins of the Father". 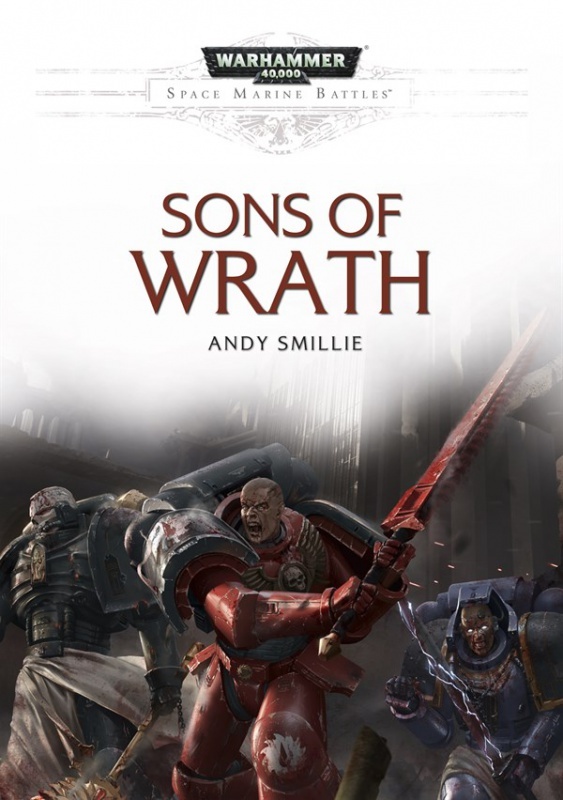 2/ Sons of Wrath = Nouvelle de 160 pages hardback de la série "Space Marines Battle" après la bataille de Terra. This is the story of the origins of the Flesh Tearers Chapter, forged in the bloody aftermath of the Horus Heresy. 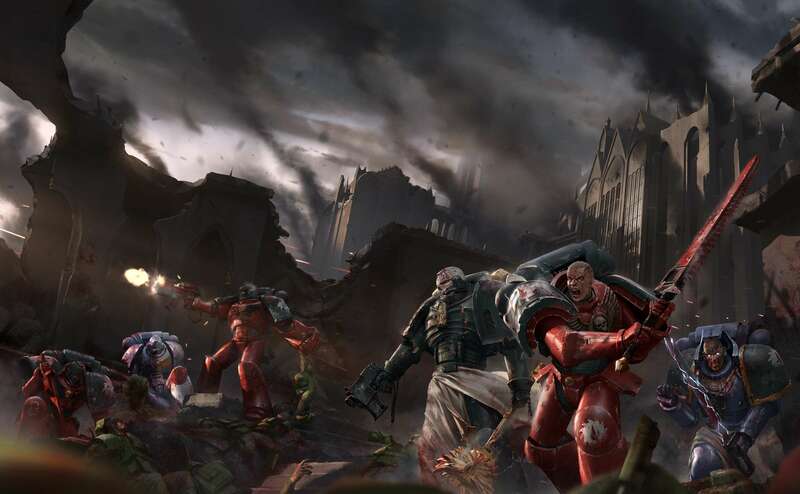 With the Blood Angels divided, First Chapter Master Amit must unite his brothers with a new purpose lest they fall prey to the curse of their blood. Ceci est l'histoire des origines du chapitre des Flesh Tearers, forgé dans les sanglantes conséquences de l'Hérésie d'Horus. La partition des Blood Angels oblige le Maître de Chapitre Amit à unifier ses frères autour d'un but nouveau, s'il ne veut pas qu'ils ne deviennent la proie de la malédiction dans leur sang. Amit stood alone in the shadows of his cell, careful to avoid the rear wall, where a shimmering stasis field shone blue in the darkness. He stared at the suit of Terminator armour suspended in the pale strands of light, and flexed the familiar joints of his own power armour, listening to the gnarled purr of its well-worn servos. His armour was as much a part of him as the twin hearts beating in his breast. By contrast, the Terminator armour was a heavily bastardised suit of war-plate. Re-forged at Guilliman’s request, it had once belonged to Brother Bial of the Blood Angels First Company, but like the others whose battleplate the Terminator armour had subsumed, he was long dead. The Crux Terminatus on the left shoulder guard contained a shard of the Emperor’s own blessed armour. The storm bolters worked into its gauntlets had been taken from Brothers Aquinus and Furiel, veterans who had died by Sanguinius’s side. Amit stepped closer, casting his gaze over the perfectly polished ceramite. It was meant to honour the reformation, to announce that the Imperium was unbroken, that its will was as strong as ever. Guilliman was an arrogant cur. The primarch of the Ultramarines had taken from him all that he was. 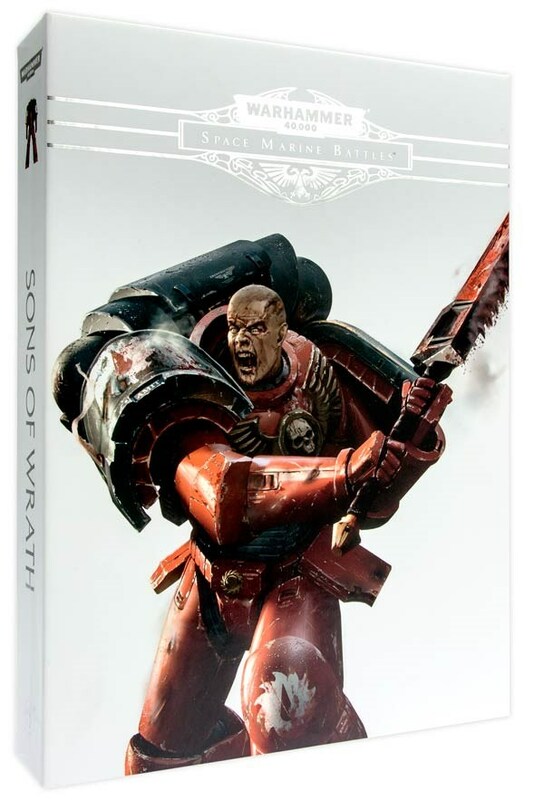 He had stripped him of his identity and sought to replace it with a suit of armour, with a title: Chapter Master of the Flesh Tearers. Amit roared and smashed his fist into the wall. He raised his hand and struck again, buckling the plasteel, sending echoes of shock through his flesh. Guilliman could take his decree and choke on it. ‘Azkaellon.’ Amit spat the Blood Angel’s name. Azkaellon had been first among equals, but he had been too shaken by Sanguinius’s death, too weak to stand his ground and fight for the Legion. The rest of their brothers had shown little more conviction. He and he alone had voiced his discontent, and it had gone unheard, dismissed as the angry words of a grieving son, the rantings of a mad butcher. Amit grinned. He was both, and the universe would do well to remember it. The pain in Nuriel’s head would not abate. It had grown from a sharp itch to a searing fire, so that it felt as though his skull were fractured, leaving his mind to bleed through the cracks. Yet he knew the pain was not there, not real in any sense an Apothecary could measure or treat. It was a dire echo of the plight his soul felt as the Victus carried him through the warp. Even those of limited mind felt a gnawing ache as they sailed the tides of the immaterium. At worst their minds broke, leaving them to descend into madness. A blessed fate compared to what Nuriel risked. 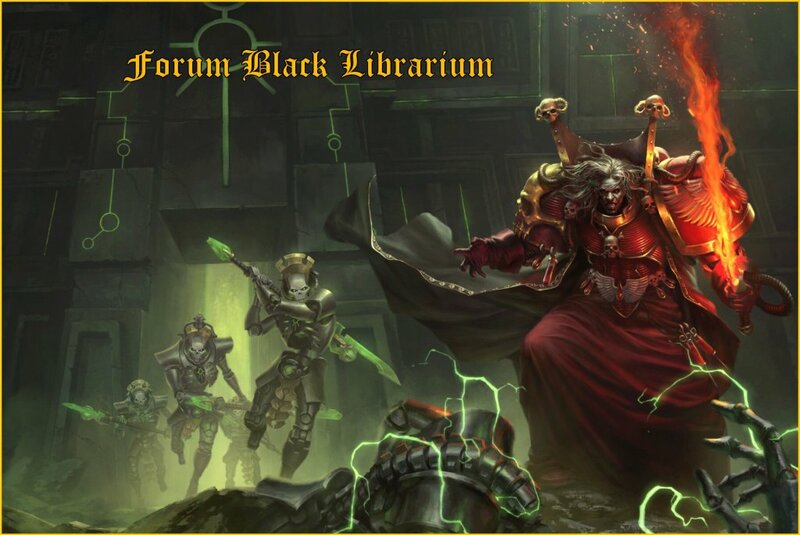 He was a Librarian and his soul blazed in the warp, a beacon calling the denizens of that daemon realm to feast. It would take but a moment’s laxity for him to succumb to their demagogic whispering. They would devour his soul and wear his flesh. ‘Not… today.’ Nuriel gritted his teeth and forced a smile. The pain was, at least, a sign that he had strength enough to resist. Roaring, he clasped his head with both hands and squeezed, grimacing as real pain replaced the phantom, easing his torment. ‘Father, armour me against corruption,’ Nuriel snarled and drove his head into the steel of the wall. The metal buckled and dented under the blow, cracking further as he repeated the motion. ‘Seal my soul against the dark.’ Blood burst from Nuriel’s forehead, slicking the wall and running down into his eyes. He slid to the floor and fought to stay conscious. Blacking out would bring him no respite and would deprive him of the pain he needed to stay focused. He looked across at the opposite wall. It shivered, rippling and groaning as he turned his gaze upon it. A churning sickness gripped his gut. He gagged, vomiting until there was nothing but bile dripping from his lips. Averting his eyes, Nuriel saw the Warrior again. The same figure who had touched each of his visions since the Gates of Terra. The Warrior exuded greatness, the warmth of triumph. Clad in blood-red armour, he was a peerless swordsman and wielded a long blade of dark metal. Nuriel followed in his wake as he cleaved his way through a horde of desperate foes, men and women dressed in the rags of outcasts. The Warrior pulled his blade from a corpse garbed in crimson and turned to face Nuriel. It was the first time he had done so, and Nuriel found himself looking up into his own eyes. ‘True faith is hard. The path to salvation is riven with strife,’ the Warrior said to Nuriel, his voice like the roll of thunder, eternal and charged with power. His entire life had been a struggle, a continual test of his strength. Born on Baal Secundus, he had killed his first fire scorpion before his eleventh year. The trials to become a Space Marine had been arduous, but were nothing compared to the hardships he endured to harness his psychic talent. The Edict of Nikaea had sought to punish him further, but he had remained unbowed, fighting the daily urge to use his gifts, even at the cost of his brothers’ lives. He had survived Horus’s final treachery and the battle for Terra. He had done everything the Emperor had asked of him. Slivers of hoarfrost spat and cracked as they formed and broke on Nuriel’s armour. Summoning a measure of his power, he stepped to the cell door. A thin line of energy danced over his fist before igniting, wreathing his gauntlet in obsidian fire. Grimacing, he drove his hand through the mag-lock and wrenched open the door. He had been alone long enough. Bathos and anger were poor company. He needed a release. ‘We cannot wait any longer. He must choose.’ Barakiel’s breath fogged in the cold air as he made his way along the corridor. Though much of the Victus was heated, allowing many of its human crew to function, this section was not. Its walkways and holy cells were meant for Space Marines. A thin layer of ice coated the walls, which seemed to be polished to the same parade-sheen as Barakiel’s armour. ‘He will not thank you for the interruption, brother.’ Tilonas kept pace beside him, the servos of his heavier Terminator armour drowning out the rumble of the ship’s engines. An attendant serf flinched as the pair drew up outside Amit’s cell. Tilonas regarded the man. He was too thin to have been gene-bred, lacking the pronounced musculature and thick skeleton of a fully developed Chapter-serf. Likely, he was just another wretch snatched from a liberated world and pressed into service. The man knelt on the floor, his tunic loose on his frame. Curiously, he had another wrapped around his shoulders for warmth. The serf’s eyes widened at Tilonas’s remark. He shot a furtive glance sideways. A naked corpse lay slumped beside him, the frozen body of another serf. ‘Perhaps he has left,’ said Tilonas. ‘You go ahead. I’ll wait here.’ Tilonas grinned and gestured to the door. Barakiel pushed open the door and stepped into the cell. Amit’s back greeted him, the Chapter Master’s attention fixed on the rear wall. Were Barakiel not accustomed to Amit’s brooding, he might have been surprised by the mess consuming the cell. Most of the chamber’s luminators had ceased to function. The few that remained lit stuttered overhead, casting jagged patches of light over the piles of ruined battle-servitors that lay strewn around like broken dolls. Amit seemed oblivious to the orphaned head that was still stammering through its activation protocols. ‘Master Amit.’ Barakiel touched his fist to his breastplate in salute. ‘What do you want?’ Amit didn’t turn around, his attention fixed on the suit of Terminator armour suspended against the rear wall. ‘You speak of them as though they are already dead.’ Amit spat the words through gritted teeth. ‘With good reason.’ The pict viewer blinked on under Barakiel’s touch. He tapped a key, manipulating the feed-selector until an image of the Apothecaries resolved. Grigori and Varel lay side by side on slabs of grey ceramite. Grigori was missing his left arm, his legs and most of his face. A series of tubes and automated syringes worked to maintain what remained of his torso. Varel’s body was intact save his abdomen, which looked like it had been ripped out to allow whatever had killed him access to his innards. His skin was dyed blue, an after-effect of being submerged in bio-solution. His chest cracked where the Apothecaries had tried to repair the damage. ‘As you wish.’ Barakiel bit down a retort and dipped his head in acquiescence. Nuriel slipped a blow meant to cave in his skull and drove his fist into his attacker’s nose. He savoured the wash of blood that splashed across his scarred face. Pressing the attack, he threw an uppercut, snapping his opponent’s head back before leaping forwards and slamming his palm down into his face. The other Flesh Tearer crashed to the ground unconscious, his nose a mess of ruined cartilage. Nuriel held his position in the middle of the duelling stone. The monolithic slab of Baallite rock all but filled the low chamber. Braziers piled with burning coals bordered its high sides and threw jagged light across its surface. Weapon and equipment racks shadowed the stone’s circumference. Three stone statues hung out from the walls like the figureheads of ancient, Terran sea vessels. The first was of Sanguinius, unarmed and garbed in a simple robe. The other two were of his sons. Each was armoured and wielded a single blade. The triumvirate represented the Tempest of Angels, the honorific duel the chamber was fashioned to host, where one combatant fought to protect Sanguinius, while the other attacked. Nuriel grunted in derision. Sanguinius was dead. Now there was only attack. ‘Who’s next?’ He turned in place, casting his gaze over the other Flesh Tearers assembled in the chamber. Nuriel tensed, pivoting to his left as a blade stabbed towards him. Parrying its edge with his vambrace, he speared his other hand over the top, driving his fingers into his attacker’s throat. The Flesh Tearer, Brother Manakel, gagged and dropped his weapon. ‘You insult me. I cannot be blindsided by such a careless attack,’ said Nuriel, grabbing the back of Manakel’s head, holding it firm as he drove an elbow into his face. Nuriel struck again and again, grinning as he heard the crack of bone. He released Manakel, letting him topple onto his back, and moved to finish him, raising his boot to bring it down on the prone Flesh Tearer’s head. ‘No!’ Brothers Vaul and Sere roared and leapt onto the duelling stone. Nuriel abandoned Manakel and met the other two Flesh Tearers head on. Splaying his fingers, he channelled his will into a raw bolt of telekinesis and unleashed it against Sere. The psychic shockwave struck Sere in the chest, cracking his breastplate and propelling him from the platform. Nuriel grinned in triumph, continuing his charge to crash into Vaul. He wrapped his arms around the other Flesh Tearer, tackling him to the ground. Pinning Vaul’s arms with his own, Nuriel used his head like a hammer, smashing it down into his opponent’s face. Vaul struggled in vain to free himself, his armour’s servos spitting in torment as Nuriel’s embrace began to crush it. Nuriel continued to attack, pounding Vaul’s skull with his own until the other Flesh Tearer’s body went limp. Blood dripping from his face, Nuriel got to his feet and stretched his frame. He could feel every muscle in his body as it tensed and relaxed. He had rarely felt so alive. He was stronger, faster than his brothers, a champion among champions. He snarled as a needle of disquiet burned his gut. If only Sanguinius could see him now. He knew his lord would not have made Amit’s mistake. Wiping Vaul’s blood from his eyes, he looked down, watching Manakel with faint amusement as the Flesh Tearer grimaced and rolled onto his front in an effort to get to his feet. A blade lay just beyond Manakel’s grasp. Nuriel paced around him as he struggled forwards, reaching for the weapon. bone. He released Manakel, letting him topple onto his back, and moved to finish him, raising his boot to bring it down on the prone Flesh Tearer’s head. ‘Learn when you are beaten.’ Nuriel grabbed Manakel by the throat, and hoisted him into the air. ‘Nuriel! Put him down,’ Brother-Sergeant Seraph barked, stepping onto the duelling stone. The rock was awash with the blood of his brothers. Blood begets blood. The thought drew a growl from Seraph. He would make Nuriel bleed for his sins. ‘Not yet,’ Nuriel roared and threw Manakel at Seraph. The sergeant dropped into a roll, avoiding Manakel’s body as it shot past him to strike the chamber wall. ‘Death then,’ Seraph said and drew his weapons, a vicious chainaxe and short-bladed chainsword, which howled as he thumbed their activation studs. Silence and darkness held dominion over the Reclusiam. The four thousand electro-braziers that hung from the ceiling had been extinguished. The cohort of psyber-cherubs that had attended the lanterns had been slain, along with everything else. They had yet to be replaced, and so the eaves and rafters were silent, devoid of the cherubs’ singing and the clacking of their golden wings. It was as though the chamber itself were in mourning, waiting for the brotherhood it served to lend a voice to its pathos. ‘The Blood lend me strength.’ High Chaplain Andras knelt in the chapel’s nave, his ashen tunic stretched around his torso. He looked up at the bronzed altar. It was the same pulpit he had preached from for three decades. On it stood the same lectern he had braced himself against as he preached the Moripatris and delivered battle eulogies. ‘Emperor, keep me in Your sight.’ He sighed, feeling as though the weight of the chapel itself were pressing down upon his shoulders. Everything remained the same, and yet it was not. The stone of the walls was bare, stripped of iconography and sculpture. The marble plinths bordering the chamber were empty so that no pantheon of heroes gazed down upon him. He cast his gaze to the ceiling, his enhanced eyes finding the image of the Emperor in the darkness. Rendered in oil and wax, the painting spanned the domed ceiling and depicted the Lord of Mankind in the guise of a warrior cleric. Armoured in golden plate, the Emperor wielded a bronzed mace and clutched a thick parchment. His mouth hung open in sermon while His eyes were narrowed in judgement. The many worlds of His domain bled into one other, blending to form a cloak that framed His shoulders and spilled out around His feet. ‘Why?’ Andras whispered, his voice faltering as he spoke to the painting. He turned, surprised to see Chaplain Zophal stood behind him. The Blood Angels Chapter symbol had been ripped from his pauldron, leaving behind a jagged wound of grey metal. Scorch marks covered his armour like a foul rash where the purity seals and litanies of battle had been burned away. ‘Not even our father could be certain of the future. He was a warrior first and our sire second. The Emperor needed his aid. Would you not have laid down your life as he did?’ Zophal’s eyes were hard, probing Andras with an interrogator’s stare. Zophal said nothing. He would not allow his thoughts to turn to such matters, and even if in weakness and selfish pride they did, he would never speak of them. ‘Sanguinius keep him.’ Andras clasped his fist to his chest in salute. ‘I will see to it.’ Zophal stood, his armoured footsteps barely making a sound as he crossed the chamber. ‘His time among the sons of Corax was well spent,’ said Andras. The two said nothing for several moments, each alone with his thoughts, before Andras broke the silence. ‘Are we simply to forget the dead?’ The High Chaplain gestured to the rows of votive candles behind the pulpit. There were thousands upon thousands of them, stretching in serried ranks back into the cloisters and rising up to meet the eaves. Since the Reclusiam’s consecration, such candles had been lit in honour of the dead. Now, only a single flame flickered in the darkness. ‘I do not know which concerns me more, the angry dead or the sorrow of those left behind,’ said Andras. ‘Is that why we journey to Zurcon? To vent our anger?’ asked Andras. ‘And it is far from the crusades of our brothers,’ said Andras. Andras’s reply was lost under a series of heavy footsteps. Amit turned to find Druel by the chamber’s entrance. Even without his Terminator armour, the Flesh Tearer was huge. Clad as he was in it, he more closely resembled the idealised statues of Space Marine heroes that adorned the plazas of Imperial cities. ‘The rage?’ Andras tensed, his voice a whisper. The death of their father had done more than undo the Legion; it had cursed them, leaving them with visions of doom and a beast’s thirst for blood. The madness was incurable. It claimed more of their brothers with each passing cycle, turning them into frenzied killers who made no distinction between friend and foe. Andras looked to the votive candles, idly wondering how long it would be before he had ignited them all. ‘The Blood protects,’ he whispered as the door closed behind Amit. ‘Not today,’ Druel said, following Amit from the chamber. par contre curieux mélange d'époques: c'est pas censé parler du M31? En pré-commande en version Hardback normal pour la semaine prochaine, disponible en Ebook de suite. Lui, je vais le dévorer.